Police reporting 35,000. If that was correct then 10,000 up on last year but have seen estimates of up to 80,000. One thing for sure – there certainly is enthusiasm for Indy. Decided lack of cover by MSM. BBC reported it once, then had two unionist snides on evening programmes girning about people daring to take to the streets. On Sunday's Daily Politics Scotland Paul Hutcheon & Katie Grant giving their opinion, him pointing out that millions weren't there - I kid you not. And the woman remarking that folk were just having a day out. She also thought that SNP organised the march. Imbalance is one thing – stupidity makes it harder to swallow. Speaking of stupidity, the Sunday Herald has managed to take idiocy to Olympic heights. Not content with seriously upsetting most of its readers with quite appalling coverage of the independence march it then runs an editorial the following sunday along the lines of 'how dare you complain, we journalists are superior to you plebs'. Angela Haggerty, their new News Editor, goes on the attack on twitter, then outs Mhairi Black's partner 'by mistake' and then declares herself the victim when those on twitter pull her up for such crass behaviour. 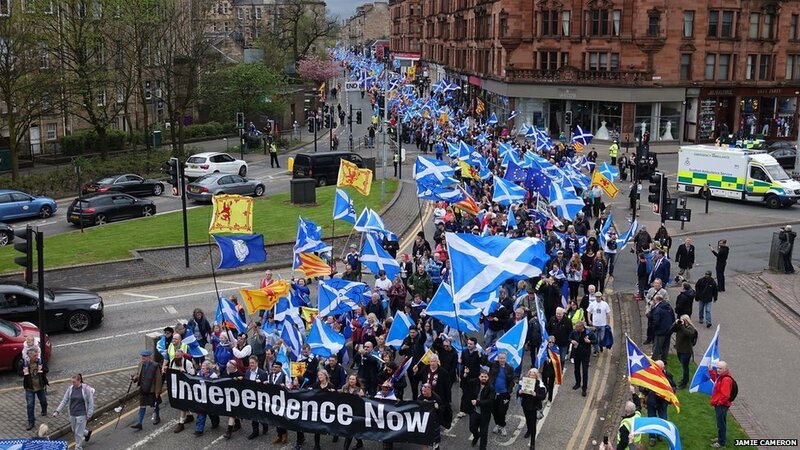 Another hugely successful march for independence in Dundee, over 16,000 people. Interestingly STV actually featured it on its news and while the BBC news pretended it didn't happen they at least reported it on its website. Is that National Farmers Union? All the pensioners that can should be out marching as if they can't get their medication a lot of them will be goners. Changed their tune. Wonder if Kirstene 4 Angus is having second thoughts now there's no foreign labour to farm her father's fruit farm. Farage, not content with stirring hatred against muslims and foreign people is now suggesting the EU want to see the provisional IRA take up arms again. Its absolutely unbelievable, this idiot of a man is one of the architects of the destruction of the good friday agreement; classic Goebbels, tell the biggest lie you cam and keep repeating it.